Eataly has arrived. Here’s what to expect from this sprawling Italian marketplace. If you want to follow along with Eataly coverage through the day, follow @GlobeFood on Twitter or @bostonglobelife on Instagram. You’ve heard of Eataly by now. Maybe you’ve even visited the Manhattan flagship, a gourmand’s equivalent of a Broadway show: outsize, entertaining, maybe a tiny bit overwhelming, with dozens of stalls and shops hawking everything from simple pizza to obscure olive oils to tote bags. Ours is similar, though Batali’s team — which includes New York City restaurateurs Joe and Lidia Bastianich — has been careful to put a hometown spin on things. This isn’t just a Manhattan interloper. For instance, Barbara Lynch heads up the house seafood restaurant, Il Pesce. And there is an admirable array of local purveyors, from Island Creek Oysters to New England Charcuterie. When the Manhattan version opened in 2010, it delighted food-savvy New Yorkers seeking an Old World shopping experience akin to marketplaces of yore, and with brand-name pedigree. Spanning 45,000 square feet inside the Prudential Center, the three-story marketplace is open to the public for the first time tonight. Some numbers: The Boston version is a labyrinthine 45,000 square feet, with 10,000 products, four restaurants, 10 casual eateries, two cafes, three bars, and a cooking school, spread out over three levels. On the third floor, there’s a restaurant, Terra, still shrouded in a bit of mystery. 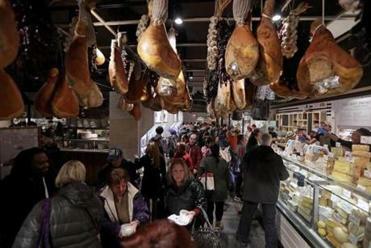 (Eataly’s partners say that it will open early next year, so as not to overshadow this debut.) At the helm of it all is Batali, the twinkly eyed pied piper eager to show off his newest baby. 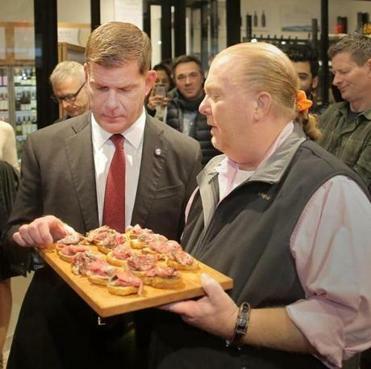 Mario Batali and Mayor Marty Walsh at Eataly Boston. “You have chosen us, and we have chosen you!” he shouts as the tour begins, but not before a lovely waitress materializes with prosciutto, Fontina, and basil crepes folded as carefully as an origami napkin. Boston is hardly the only chosen city, however. There are 30 stores worldwide, with more to come. Founder Oscar Farinetti launched the first Eataly in Turin, Italy, in 2007, as a dining and learning center. Now there are branches from Chicago to Seoul. More are slated for Las Vegas and Los Angeles. Batali is a partner in Eataly USA along with the Bastianich duo, Adam and Alex Saper, and Oscar Farinetti’s son Nicola. 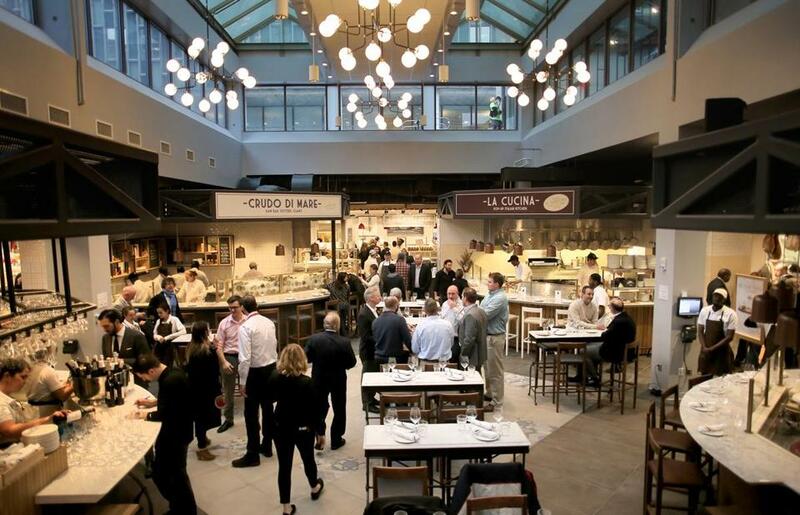 Still, Boston’s Eataly team has gone local in its hiring, too, with more than 500 employees, including 140 chefs, sous chefs, and cooks, drawing on a relatively small nearby pool. Many were hired from schools like Curry College and Johnson & Wales University. One notable hire is chef de cuisine Dan Bazzinotti, formerly at Cambridge’s BISq. Not everyone is a native, though: Eataly’s executive chef, Jason Neve, was culinary director at Batali’s Las Vegas restaurants, including Carnevino and Otto. “Lynch! Get over here!” Batali cries. Lynch, decked out in a black tunic and leggings, skips toward him. “He calls me the patron saint of Boston restaurants,” she says. He beams. And we’re off. We pause at La Rosticceria, a rotisserie counter with local meats from places like Stillman’s Farm in Massachusetts and VT99 in Vermont, perhaps pit-roasted or brined. Order them in bulk or in panini while strolling the store, but please, don’t get creative with condiments. The meat is so flavorful that you shouldn’t need to. “We just use a little olive oil or salt. No extra mustard here!” says Batali. Across the way is a wine shop, home to 1,200 labels, plus Italian and local beers. This could intimidate the average shopper, but the room is festooned with helpful signs breaking down alcohol terminology, from lambics and sours to brut and extra dry. 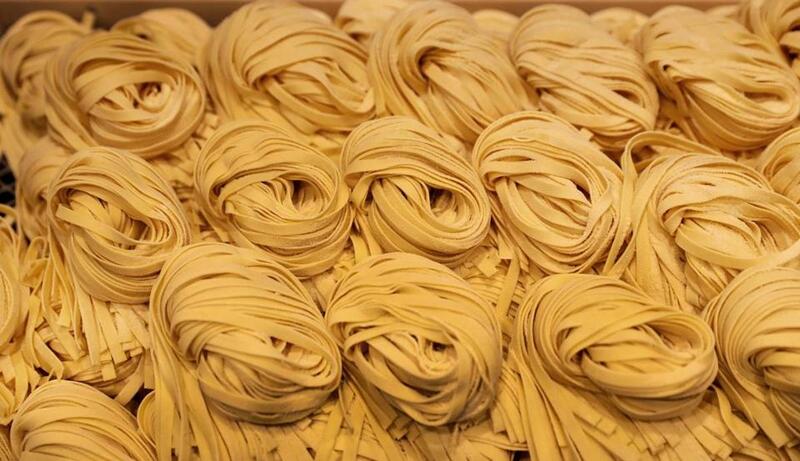 Piles of pasta at Eataly. “The pasta store separates us, and now you know where to buy it,” he says with a wink. The puttanesca is splashed with the tiniest amount of sauce, so as not to overshadow the al dente pasta. There’s also Neapolitan pizza — chewy and a bit tart, with a zing of tomato sauce and a splotch of creamy mozzarella, cooked for 90 seconds in a gold-domed wood-burning oven. A moment for the mozzarella: Eataly is home to a “mozzarella lab,” presided over by fourth-generation cheese maker Lourdes Smith. Smith is a beloved figure in the Boston restaurant community, having operated Somerville’s Fiore di Nonno for years before closing in 2015. She supplied chefs and restaurants with her signature orbs; now they’re at Eataly, stretched daily by hand. 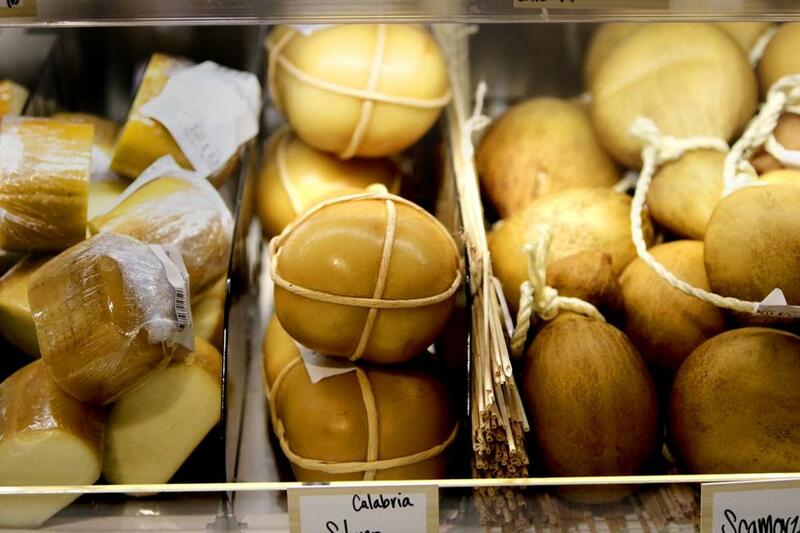 This kind of top-quality local purveyor is important, Batali emphasizes throughout the tour. This is Eataly Boston, after all, and he was careful to approve vendors you wouldn’t find in other cities. There are Island Creek oysters; salami and soppressata from New England Charcuterie; seasonal fish from Red’s Best and Wulf’s Fish; fresh ricotta and yogurt from Narragansett Creamery; meat from Savenor’s Market. The idea is that customers can pause to chat and ask questions while snacking on a margherita pizza ($13) or handmade chips ($2.80), as if at their friendly neighborhood fishmonger or butcher — albeit housed in a behemoth market. Transparency and education are part of the mission at Eataly, hence those open kitchens, signs explaining each product, and a cooking school, where Lynch and Lidia Bastianich are among the instructors. 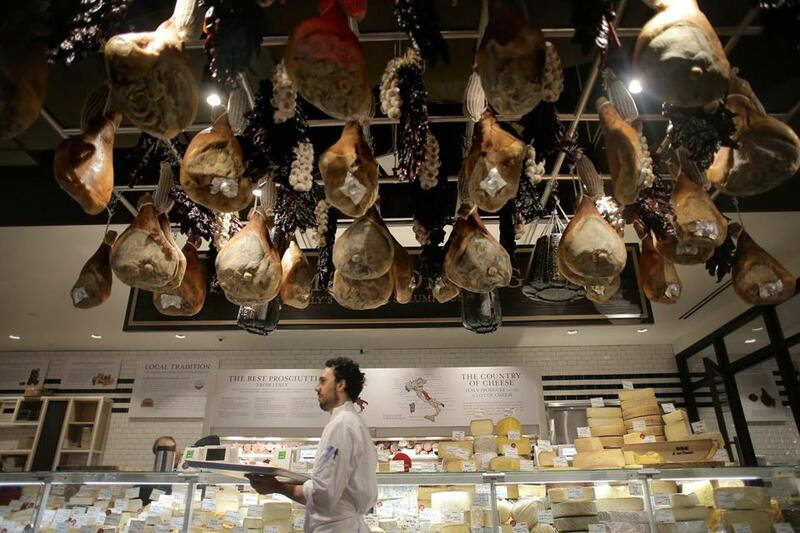 “Eataly is a place where you can eat, shop, and learn,” promises a sign near the entrance. Of course, lazy introverts can also buy prepared food to go at La Gastronomia takeout counter, where dishes are based on recipes from Bastianich and Batali. But that’s really not the point, Batali says. “We don’t want you to use us as a deli. We want you to cook at home. You are empowered!” he shouts as we move into La Piazza. “I feel like I’m in Florence,” one tour-goer murmurs. 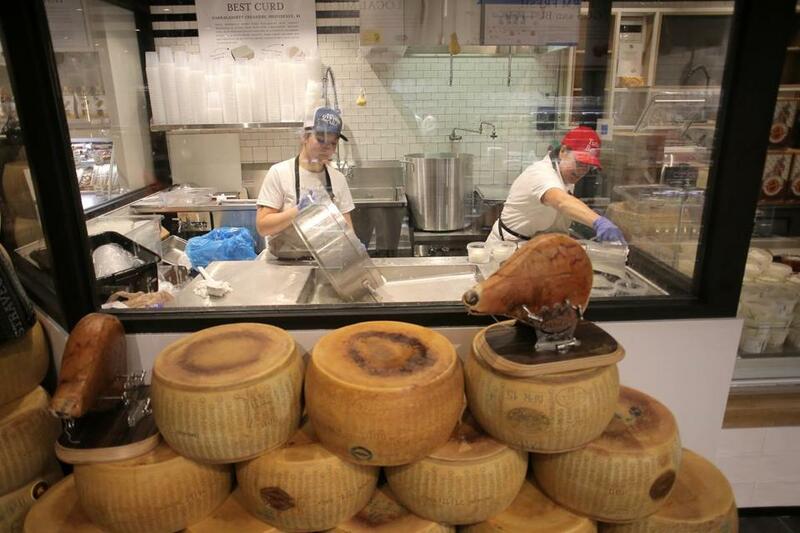 Eataly Boston is set to open Tuesday afternoon. This cluster of shops is modeled after an Italian city square, with storefronts offering seafood, drinks, and snacks. Order a glass of wine (in the $11 range), some shareable plates of meat and cheese, or a few oysters, and gab with your fellow Eatalians. It’s intimate and jolly, and will probably be immensely crowded, much like its New York brethren. For now, though, there’s an air of calm as we’re spirited to the final stop on our journey: Lynch’s Il Pesce, where we’ll sample house-made spaghetti alla chitarra with Boston mackerel. Later, I corner Lynch before leaving. “Why’d Batali come to me? The woman knows how to cook!” she chuckles, looking around. She pauses a moment to take it all in. “Imagine getting locked in here all night,” she finally says, making an eating gesture. The patron saint of Boston restaurants looks a little dazzled, too. Specialty cheeses were on display. Staff prepared for the day at Salumi E Formaggi at Eataly. Workers prepared cheese at the Mozzarella Lab.